The media and those on the left were salivating going into Election Day. The so-called “blue wave” was coming, and it was going to sweep fifty seats or more into Democrat hands in the House of Representatives. Some thought the Senate could follow as well, and deliver a one-two punch to President Trump’s jaw. Not only did that NOT happen, but Trump’s efforts helped candidates get across the finish line in stunning fashion. Perhaps that was too much for the media to bear as they came out swinging in Monday’s press conference. Luckily, Trump knows how to fight back. The Democrats and the media can’t help but feel disappointed. They lost ground in the Senate. They barely gained control of the House, and their marquee candidates like O’Rourke and Gillum lost. Perhaps this is why they were completely unhinged at President Trump’s Monday press conference. CNN’s Jim Acosta, who has no business claiming he’s an actual journalist, tried to get his facetime for the dwindling CNN audience by asking about the migrant caravan (uh, this is a post-election press conference), and he ran into a Trump buzzsaw. Trump also had to deal with American Urban Radio Network’s April Ryan. What can these people do when their blue wave turns into a ripple? It appears that doubling down on rudeness and unprofessional journalism is the answer. It’s pathetic, and hopefully, more people will catch on that the media are on the side of the left. They don’t report news. They try to influence news and drive an agenda. That’s wrong, and that’s not journalism. Let’s give a quick recap of the fantasty followed by the facts regarding Tuesday’s elections. The fantasy was that Trump was hated by all, that candidates would shun his help, that the America people would rebuke the Trump agenda, that waves of Democrats would crash down upon the shores of the House and Senate. It was to be historic. The reality is far, far different. Not only did Republicans hold the Senate, the GOP actually made gains… gains that I predicted back in the middle of October (see ). Repubilcans picked up seats in North Dakota, Missouri, Indiana, and Florida. Our only loss so far was in Nevada, a state that produced Democrat Harry Reid and a state that is trending blue. There is a possibility of still picking up Montana as well. That could yield a four-seat gain in the Senate. Trump campaigned feverishly for these candidates. He rallied for Texas Sen. Ted Cruz, who held off Beto O’Rourke and his $70 million campaign war chest. Trump held rallies in Florida, Missouri, and Indiana in the closing days. All those Senate challengers won their races. Trump said that the Democrats’ despicable attacks on now-Supreme Court Justice Brett Kavanaugh would backfire, and he was right. Every Democrat in a battleground state who voted against Kavanaugh lost on Tuesday night. Only Democrat Joe Manchin survive… oh, that’s right, he voted FOR Kavanaugh. On the House side, the media and pollsters talked about a 50-seat gain. They talked about a 40-seat gain. As it stands now, the Democrats have picked up around 28 seats, with 24 needed for control. This gives them a VERY slim majority, and was completed expected (although not hoped for). Since the House grew to 435 seats in 1914, only two presidents in their first term saw their party make gains in mid-term elections: FDR in 1934 and George W. Bush in 2002. Bill Clinton did it in 1998, but that was in his second term. That’s it. That’s all. In 104 years, history tells us that the party out of power will gain seats. All in all, Trump will gain a much friendly Senate to his agenda with the likes of Flake and McCain and Corker being replaced by McSally (hopefully), Kyl, and Blackburn. The House, under the potential leadership of Nancy Pelosi, will provide a stark contrast to Trump’s accomplishments in the first two years. Trump is fired up and ready. The media and the Democrats should beware. It just goes to show you…when there is a bigger pool of people voting (think Senate) the tide turns Red. When the smaller districts (think House) vote, especially those that include major metropolitan areas, of course those Dem strongholds are going to go Blue. Thank God for the Senate! 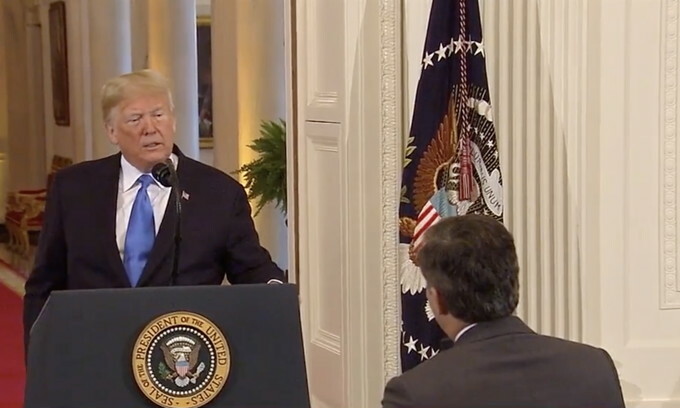 I saw President Trump dressing down Jim Acosta… it was beautiful! I keep wondering. WHY even keep letting him into the press briefings. TELL CNN if they wish to still be part of them, SEND someone else! Acosta has been officially bant from the White House. Turn in your pass. You’re done. Couldn’t happen to a nicer jerk. Long overdue actually. When Trump came onto the political scene, he made a comment early on that he would do well to revisit as a more adequate and beneficial way of handling press releases and, as CNN’s disgusting diatribe unfolded today from an inciteful, Democrat-sponsoring press it would not be a moment too soon: (Trump)”We will tell the press what we want them to know….when we want them to know it”. When those INVITED to a press conference behave themselves as crude buffoons such as acosta presented himself, those involved …AND ALL MEMBERS OF THE COMPANY THEY REPRESENT… should be immediately escorted from the building, the press conference immediately shut down, and the individual responsible for the outburst …AND THE COMPANY THEY REPRESENT… be refused and unable to attend any future press conferences during that President’s time in office. BAD behavior should be extinguished early on…or more will follow. Make the companies represented responsible for cleaning up their employees atrocious behavior. AS i’ve often said. ISSUE a memo of ground rules. ANY Network not willing to abide by them, can stay home! Yes. Rude employees reflect poorly on the management / ownership and thus must be in danger of summary dismissal from employment. There you go, comparing a scourge like Acosta to perfectly reasonable rude terrible people. CNN has become nothing more than a supermarket tabloid like the the Enquirer. They are nothing more than a comic book for entertainment ONLY. I find nothing entertaining about CNN. When it comes to entertainment, some people have very low standards. I couldn’t agree more. If Pelosi, Waters, Ocasio-Cortez, Schiff, etc. were running for the Senate, the only time they would see D.C. would be if they took a vacation there. Trump should issue new rules for decorum and behavior, and get him a sergeant of arms to enforce them. Expulsion and temporary banishment would go a long way to clearing us the Jim Acostas of the media. Overshadow, i’ve been saying since trump won, HE SHOULD set ground rules. ALL questions are done in a set order. ONE QUESTION per rotation of that order. Anyone trying to jump in, speaking over someone else, or trying to push to ge more than their 1 question per rotation, gets kicked out of that conference. Do it a 2nd time, get a month long suspension. Do it a 3rd time, and BYE BYE your credentials to the white house. ANY network refusing to abide by those ground rules, simply doesn’t get in. If they have a question, write it down and submit it in advance. That should cut down on at least some of the grandstanding from these “journalists”. Then the President can address the questions from the press, or just round file them. I suggest getting a much larger round file receptacle. When i was in the mil, and some important person came to the base (like the sec def, or VP), THAT IS EXACTLY how we were told to do it. Write down our question, submit it up the chain of command. IF THEY COULDN’T answer it to our satisfaction, it would be forwarded to the PR person for said dignitary, and when they did a Q&A, we were ONLY allowed to ask questions pre-approved to be asked..
Republicans should have won the House, but in 2017 40 of them, including their leader Paul Ryan, announced retirement. It’s their own fault. The Senate stayed tough and aligned with President Trump. They won big. It was good to see so many leave, but that left the door open for the commucrats to take it back. Fully agree. If Paul Ryan had done his job as Conservative Speaker of the House, many more good things would have been accomplished by President Trump making it that much harder for the dem/socialists to get any traction. Sad but True: Paul Ryan lost the house for the Repubs. No, they were all too busy, kissing his cheeks..
How do the creepy liberal news idiots get in to ask stupid questions to the President. Lock them OUT ! I’d love an electoral college at state levels. So many states could yet be salvaged. Ah, there goes the President telling the truth again. Don’t you just LOVE it? MAGA. Well, you come at people with ATTITUDE, then you will get it back…..This is the same thing that silly Megan Kelly had to learn to…. TRUMP IS AWESOME…. Well, CNN. You have an employee who is ineffectual due to his own antics. So what do you do? You fire him. But since you have moneyed relation filling the feedbag, you keep him on as a stenographer, but you DO muzzle him. Watching it, i was day dreaming of doing the “Vader force choke” on acosta.. THEN using TK to hurl him out the nearest window! My opinion if it really counts is to let these commie idiots keep showing their backsides , and make sure they do it a lot, so that the learned citizens of this nation can get educated about socialism, and what their real agenda is all about. I aplaud President for not throwing his podium at that moron. He does know how to handle the pressure. And I am proud of him!!! Trump is living in acosta’s head rent free. Trump OWNS the media, and they don’t like their new boss one bit. I admire the president for his labeling the MSM “fake news, and the enemy of the people.” The fact that he is right, and everyone knows it, has made them go insane. Some of them should be locked up before they hurt themselves or someone else. Given that Commie Numpties Network has been even more-obviously pro-Demoncrud since prior to 1992 (that it was called “Clinton News Network” 1993-2001) than the lumpen-bulk of the rest of US media (All Bu11 C##p, Nothing But C##p, Moonbats Spueing N-B-C, See-BS, …), epitomised by Acosta, way overdue payback! Great to see President Trump take these guys to task, HOWEVER, to all his liberal media buddies Acosta is now a rock star for getting under Trump’s skin. Watch for all the comments on Acosta’s “martyrdom” from CNN, MSNBC, NY Times, etc. Disgusting! One thing people forget about martyrs, they’re all dead. It should be understood (even by liberals) that whenever an invited guest insults the host then that is extremely rude and completely unacceptable. I rejoice in knowing that this guest is now banned from the host’s home.